After the Buddha himself, the most revered and universally popular figure in Buddhism is Avalokitesvara, the bodhisattva of compassion. Since his appearance in about the first century BCE this beloved bodhisattva has been worshipped with almost unparalleled fervor by the followers of all schools of Buddhism. Tradition says that Avalokitesvara has 108 names, one of which is Natha and it is under this name that the bodhisattva is still worshipped in Sri Lanka. Though accessible through prayer and supplication to anyone anywhere, Avalokitesvara was believed to abide on a mountain in a remote part of India where, from its lofty and cloud-decked heights, he could be as his name suggests, 'the regarder of the cries of the world'. This mountain was called Potala. Hiuen Tsiang traveled through south India in the 7th century and although he was unable to visit Potala himself he left this description of it based on what others had told him. ‘To the east of the Malaya Mountains is Mount Potala. The passes on the mountain are very dangerous; its sides are precipitous and its valleys rugged. On the top of the mountain is a lake; its waters are as clear as a mirror. From a grotto precedes a great river which encircles the mountain twenty times as it flows down to the southern sea. By the side of the lake is a rock palace of the gods. 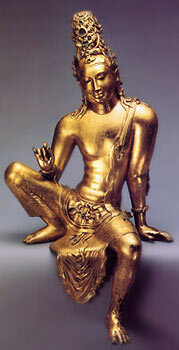 Here Avalokitesvara in coming and going takes his abode. Those who strongly desire to see the bodhisattva do not regard their lives, but fording the streams, climb the mountain forgetful of its difficulties and dangers. Of those who make the attempt there are very few who reach the summit. But even those who dwell below the mountain, if they earnestly pray and beg to behold the god, sometimes he appears as Isvara, sometimes under the form of a yogi, and addresses them with benevolent words and then they obtain their wishes according to their desires’. This description is clearly a blend of fact and fiction, a trend concerning Potala that increased as time went by. Gradually the sacred mountain came to be seen as a kind of magical fairy land, a paradise where rare medical herbs and exquisite flowers grew, where mythological animals frolicked and where those blessed enough to be reborn in Avalokitesvara's presence abided in bliss. So strong was the desire to visit Mount Potala but so difficult was it to do so that replicas of the holy mountain began to appear. In north India there was one such to the north of Rajagaha and Chinese Buddhists have their own called Putuo Shan in Zhejiang Province. The Sri Lankans created their own replica of Avalokitesvara mountain abode at Sigiriya. Rising 200 meters above the jungle-covered plain Sigiriya is a huge flat topped rock covered with ruins and represents one of the most astonishing Buddhist complexes ever built. F or at least a century after its rediscovery Sigiriya was thought to be the palace where the patricide King Kassapa I lived in fear of his brother. At least this is the story the Culavamsa tells. But this chronicle was written some seven hundred years after Kassapa and at a time when Mahayana Buddhism had disappeared from Sri Lanka. The chronicler either suppresses Sigiriya’s Mahayana origins, or more likely didn’t know of them. Sigiriya was very clearly a Mahayana monastery and meant to suggests Mount Potala or an imitation of it. The Culavamsa calls the place the Lion Mountain (Sihagiri) but the earlier and probably original name was the Mountain of Remembrance (Sihigiri). Sigiriya functioned as a centre of religion There are numerous caves around the main rock with 24 inscriptions dating from between the 3rd century BCE and the 2nd century CE indicating that it was inhabited by ascetic monks during that period. 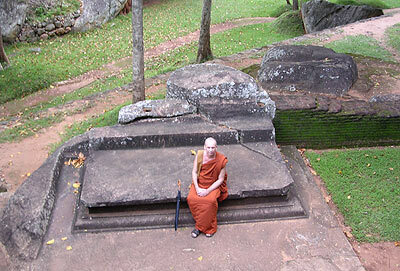 Later it became a branch of the Abhayagiri and continued to function as a monastery up to at least the 10th century. The mountain, temples and gardens of Sigiriya are surrounded by a series of impressive walls and moats nearly two kilometers long. The outer wall now barely visible in parts was made out of rammed earth and next to which is a moat. Beyond this is a second moat and a wall made out of brick. The inner moat is 80 feet wide, 14 feet deep and lined with stone blocks while the inner wall is made of rubble, stone and earth dug from the moat and is 30 feet high. The main entrance is on the west and was probably approached by a draw bridge. There are other gates through both the northern and southern walls. Crossing the inner moat and passing through the inner wall the pilgrim enters what were once a series of extraordinary gardens imitating those on Mount Potala. On the right is a sunken garden, the corresponding part on the left has not yet been excavated. The whole complex is sunken and hard to make out but it seems to have consisted of flower beds and variously shaped ponds at different levels and fed by waterfalls and springs. The main path then leads to second part of the water garden which is 525 feet long, 78 feet wide and leads upward in a series of low terraces. Water stored on the lower slopes of the mountain was fed under pressure through underground pipes into fountains from where it flowed into meandering streams, over small waterfalls and into little pools and ponds. The circular limestone slabs with holes in them are the fountains and after heavy rain they still work. On both side of this garden are two islands which originally had buildings on them, four causeways could approach the outer most of these islands. Further along on the left are several large rectangular brick lined pools with stepped passages leading to them. and on the left is a large octagonal pool , one of its sides formed by a huge rock. The path through the Water Gardens now rises in a series of terraces to the Rock Garden. If the pilgrim makes his or her way towards the south he will eventually come to an immense boulder that had cracked in half. The top side of the half that has broken off and fallen away has been cut into a level floor and has a large low throne carved out of it. Directly below this rock on the west is another throne carved out of a boulder and a cave. On the east side is a narrow paved gallery in which is a small seat facing the rock wall. Like all these seats and thrones this was probably used for meditation. At the end of the gallery is a cave with a low wall around it and a throne in it both again cut out of the living rock. Fragments of paintings can still be seen on the roof of this cave. Right opposite this cave is another one which a brick wall around it which monks may have lived it. From here a flight of stairs lead down to the dramatically shaped Cobra’s Hood Cave. The small fragment of painting on the roof of this cave gives some idea of how sumptuously the monasteries and temples of Sigiriya were decorated. The monks of old have very skillfully enhanced the natural environment to make it conducive to meditation. All sorts of gods, demi-gods and mythical beings were believe to dwell on the slopes of Mount Potala in ascending order, with bodhisattvas like Tara towards the top and Avalokitesvara in his glory above them all. The sides of Sigiriya rock were actually painted to resemble the abodes of these deities. All these paintings have now disappeared except for those in a small concave area sheltered from the elements. There are 19 figures altogether probably representing Tara, the consort of Avalokitesvara, and her attendants. 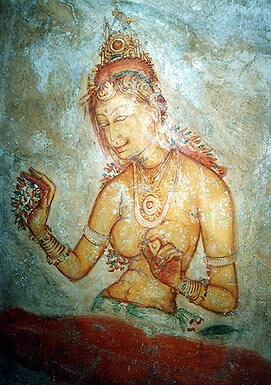 The artists of Sigiriya depicted Tara numerous times in accordance with one of her characteristics as mentioned in the Manjusrimulakalpa; ‘She dwells multiplying herself again and again in a thousand places to increase everyone’s contentment’. The figure which archeologists number as B 10 is the loveliest of these and in my opinion is one of most superb representation of a female from the ancient world. Tara is shown looking down from her lofty abode and she has an almost ethereally beautiful smile on her face.. Her left hand is in the gesture of teaching while her right hand holds blossoms which she is about to toss so that they sprinkle down. She is naked from the waist up and wares bejeweled bracelets, armlets, a three-stringed pearl necklace and another necklace with a large jeweled brooch hanging from it. Rather than earrings she wares large ear plugs. Some of her hair is gathered up in a jeweled crown while the rest with flowers tied in it is left to fall down her back. A spiral iron staircase now gives the modern visitor to the privilege of seeing these remarkable paintings up close. All the other figures will more than repay careful inspection and unhurried contemplation. It is remarkable to think that the artists who painted these glorious pictures took such care over their details despite believing that no one but they would ever see them except from a great distance. Clearly the creating of the figures wasn’t just a commission for these artists , it was an act of the deepest faith and devotion. Proceeding along the gallery the pilgrim will eventually come out into a large terrace. The northern end of this terrace drops away some 40 feet and on the rock below are numerous holes indicating that a wooden staircase once led up to the terrace. Originally a huge crouching lion made of brick sat on this terrace and people climbed to the top of the rock by a staircase that went through its mouth. Now only the lion’s two huge paws remain. Those coming to Sigiriya to worship Avalokitesvara and Tara climbed to the summit, made their way around its eastern side and then climbed the stairs on the west up to the main shrine which was on the highest point of the summit, that is, on its northern end. The summit of the rock takes up an area of about 1.6 hectares and was covered with monasteries pavilions, gardens and temples. A high wall surrounded the whole summit. It is worth spending a few moments contemplating the enormous effort needed to carry all the bricks, stones and other material to the top of this rock. On arriving at the top the pilgrim should take the paved path that leads to the left thus keeping the main temple to his or her right. A little further along to the left of the path and below it is a magnificent throne carved out of the living rock. The square holes on the front corners of the throne were for the wooden pillars that once supported the canopy over it. 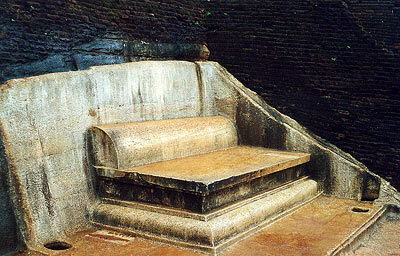 This throne may have been for monks giving sermons but as there is no room for an audience this seems unlikely. It was more probably meant to represent Avalokitesvara’s throne on Mount Potala as mentioned in so many descriptions of the holy mountain. Proceeding along the path the pilgrim soon comes to a huge reservoir again cut out of the rock and over 40 feet deep. This represents the one on Mount Potala but was also used for bathing. Rock cut stairs lead down to the water. Sigiriya is 10 km from Inamaluwa which is on the main Kandy to Anuradhapura road. © 2007 Copyright Ven. S. Dhammika & BuddhaNet/Buddha Dharma Education Association Inc.